Hey it’s been awhile since I actually posted. I decided not to do a SXSW retrospective because, well, like last year was the year of the laptop, 2012 was the year of the stand up drum set. I guess people needed some better live drum sounds to go with the loops. 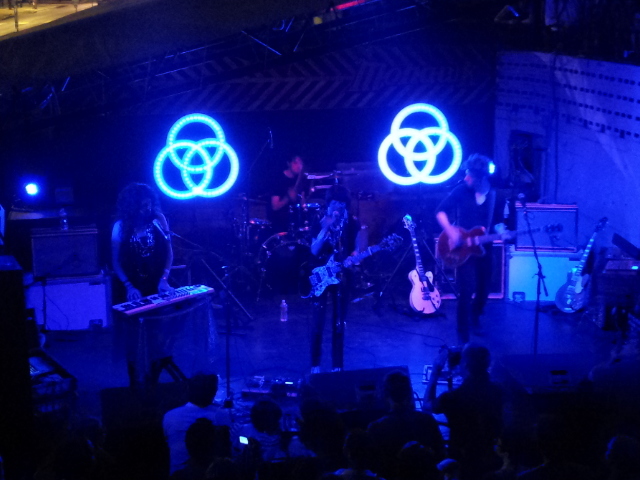 That was on witness last Friday as I took time to see School of Seven Bells with Exit Music at the Mohawk. Not only was it was refreshing little set they both put on, but the new setup at the Mohawk impressed me mucho mucho mucho. I figured we’d be making at least one pit stop to The Mohawk for SXSW but alas the schedule never landed us at this tasty little venue. Although it’s little no more. The last I was out on the deck for a show was way last year for El Ten Eleven. Since then, the Mohawk built two new terrace in front of the deck. This let to some tiered standing room only sections and even more so, great shots for my video blogging camera thingy. Thank you whomever came up with that idea. Up first was Exit Music and I was nicely surprised. I seemed to remember them from something last year, either a blog or a magazine article or a showcase. I didn’t remember what they sounded like. But like I mentioned above, the stand up drum guy was there with some digital pads banging away on some creative beats. The lead singer lady had just enough soul to follow through, even though I figured she may not hit the high notes (she did). All in all a great opener for our headliner. The School of Seven Bells came into my live via MySpace of all places. I believe I heard them from a Fader post and decided to Friend Up on the ole ‘Space. At the time they only had one album and I marked it as a maybe. Well, Disconnect From Desire came out in 2010 and I became a big fan. Now Ghostery is out and SoSS sampled all of them Friday night. The driving beat and monotone female double leads are the signature mark of the School of Seven Bells. I think it’s best described by watching ‘I L U’. It’s like they play with the line between dance and dark. At more than one occasion I felt myself intensely falling into the band’s downspiral only to be picked back up with a fresh toe tapper. SoSS served balance between the two just right. Now I find myself going back to the videos at least once a day. So that was the show. The juxtaposition between dark and dance was on full display with both Exit Music and School of Seven Bells. The cool evening wind blowing on a somewhat cloudy Friday night in Austin provided a great backdrop to the experience. The Mohawk, and it’s newly formed foundation, could be the only place in town where I could enjoy the breeze that accompanied the dark warm glow from the stage below. Previous PostSXSW In All Of Its GloryNext PostWhere The Hell Have You Been?